Whenever I see the phrase “YA dystopian”, it scans as “Yay! Dystopia!” in my head. I say this because I am perhaps not the best person to write dystopian stories. For one thing, I’m generally a cheery soul. For another, I don’t really believe in most of what SFF posits as dystopia. All societies have good and bad aspects, and any society that proves stable for the long term is one that works for the majority of its people, however horrific it might seem to outsiders. One person’s nightmare is another person’s Tuesday. That’s the thing, though; most dystopian fiction doesn’t depict the kind of society that would be stable in the long term — not without some sort of artificial engineering of human sociology or external pressure keeping it going. Most of the dystopias I’ve read are so unrealistic, so extreme, that most of their citizens would be miserable; no one would put up with that. There’d be a revolution, for good or for ill. So sometimes I write dystopias that feature artificial/external pressures — like human colonies struggling to survive on a hostile planet, in the case of my story “Bittersweet” (which unfortunately seems to not be posted at Abyss & Apex anymore… I’ll post it here shortly if I can’t find a way to link it there). Most of the time, though, I write dystopias set right here in America, or in recognizable variations on future America. “Valedictorian” is an example of the latter. 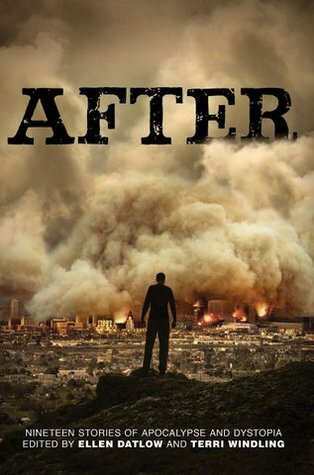 It’s also my first YA dystopian, and it appears in After: Nineteen Stories of Apocalypse and Dystopia (eds Ellen Datlow and Terri Windling), which is out today. “Valedictorian” is set in an ordinary high school in a middle American town, and it follows an ordinary teenage girl, Zinhle Nkosi, as she strives to become the top student. Except, no one else is striving against her. There’s a reason for that. AFTER has gotten a lot of positive buzz already, including an elusive and rare positive review from Kirkus. Last Short Story also did a podcast review of the anth, with some intensive discussion of several stories — including mine! — along with an overall review. So check these out. Also, for those of you who are in the NYC area, I and some of the other authors in the anth will be doing a reading/talk at Books of Wonder on Thursday night. And then if you’re feeling all “Yay! Dystopia!”, buy it — and tell me what you think!